You can find a pack of clear window decal sheets at any office supply store. At a standard 8 ½ by 11 inch size, they’re printer-friendly too. They attach to any glass surface, they’re easy to peel and they can be used over and over again. 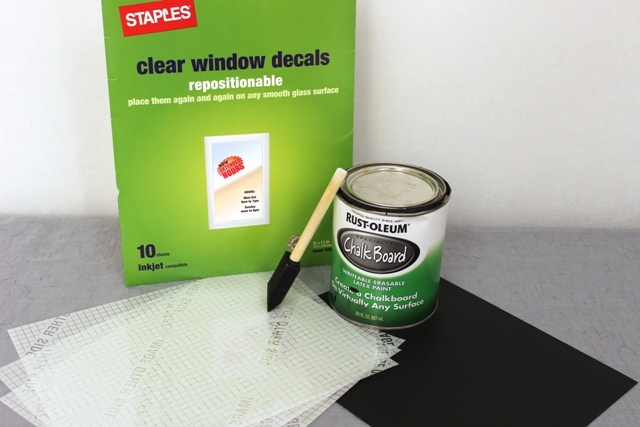 Take one clear window decal sheet and lay it flat on a newspaper-covered table. Make sure the printable side is facing up—not the side that will be peeled off. With your sponge brush, cover the printable side of the sheet with chalkboard paint. Set it aside until it dries completely. 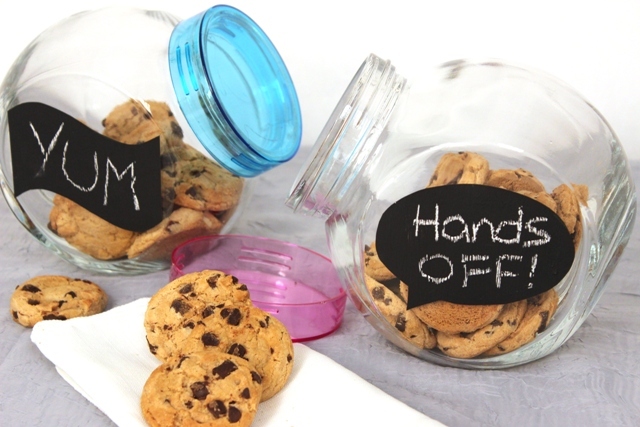 Print out this free cookie jar label template onto a piece of cardstock, or print out any other shape you’d like for your label. 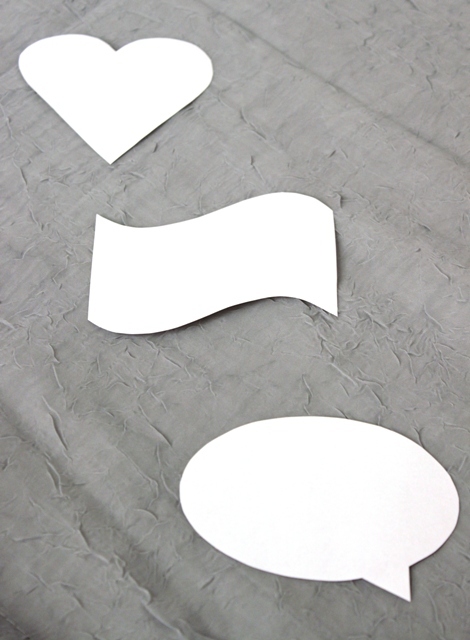 Carefully cut out the shape from the cardstock. Using the cardstock shape as a stencil, trace the shape onto the dry chalkboard decal sheet. Depending on the size of your label, you can probably fit a few shapes onto one decal sheet. Cut the shapes out of the chalkboard decal sheet to create the finished label. Peel the backing off the label, and then stick it directly onto your cookie jar. That’s it! 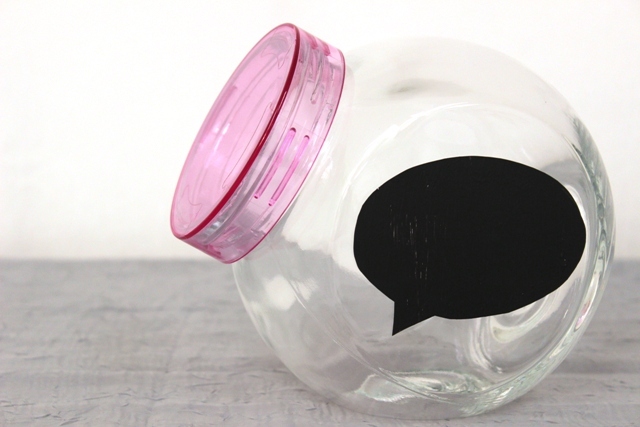 Now you have a totally cool, totally customized cookie jar that you can give to your best bud … or keep for yourself. All you need to do now is use chalk to write a cute message on the label, and then fill the jar with your favorite cookies! You can make as many different label shapes as you want, and switch them up whenever you need a change. The labels are also super-easy to peel off when the cookie jar has to be washed. 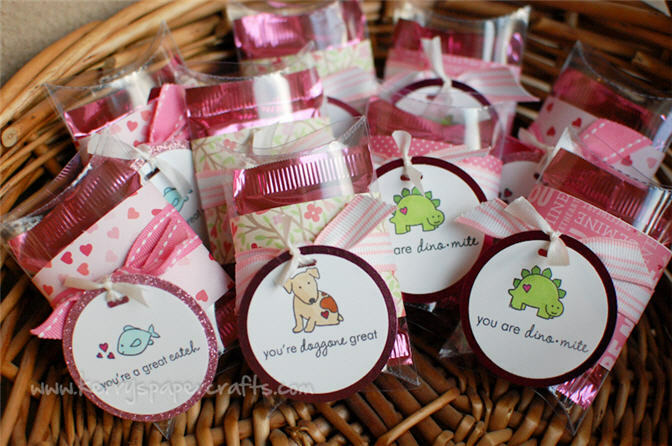 Because you can use them again and again, these awesome labels will last you a lifetime … even though those scrumptious cookies inside the jar won’t! 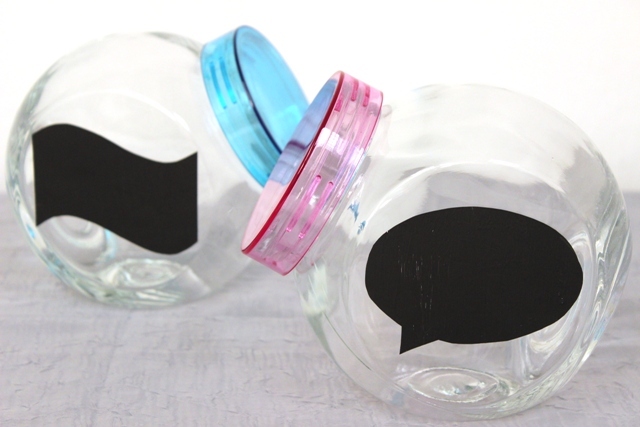 What creative shapes will you be making with your DIY chalkboard cookie jar labels? Your best friend is in town, and she just invited herself over for an impromptu coffee date. You’re excited about your long overdue catch-up sesh, but you don’t have enough time to throw together a jaw-dropping dessert buffet. Don’t freak out! You can still give your BFF the sweet welcome she deserves with items that are already stashed in your closet. Just break out some readymade cookies (everyone loves them, and they don’t require any baking!) and serve them in style with this last-minute DIY cookie jar. You’ll have an uber-chic—and super-scrumptious—treat ready in mere minutes! 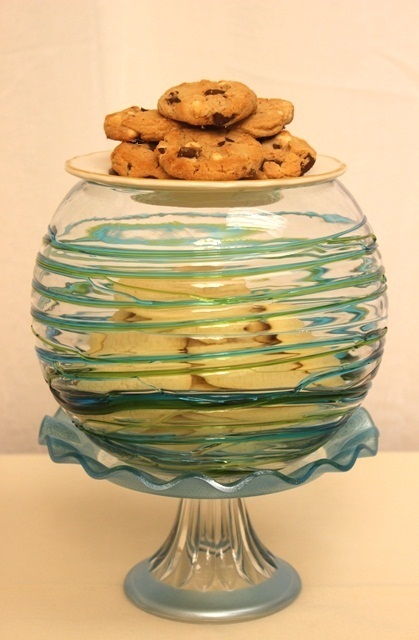 Then, fill the vase with cookies and cover the mouth of the vase with the small plate. The round base of the plate should be slightly smaller than the mouth of the vase. That way, the plate can fit on top of the vase just like a lid. The rim of the plate should extend past the mouth of the vase, making it easy to remove and replace the “lid” as needed. You’re done! Place a few cookies on top of the plate to give your friend a sneak peek at the mouthwatering treats that await her in the cookie jar! Now you can spend more time filling in your BFF on all your latest news instead of scrambling to make an over-the-top display of sweets! 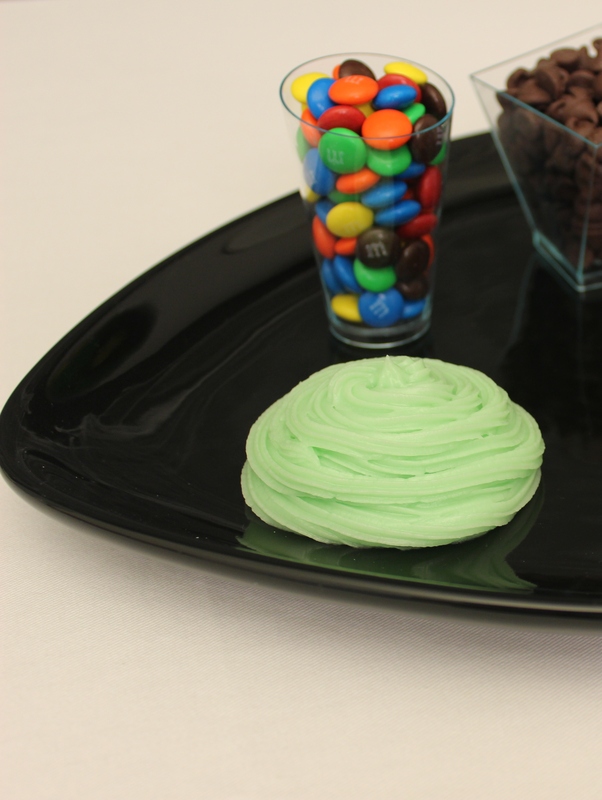 What other DIY tricks do you like to use when you have to serve a last-minute dessert? 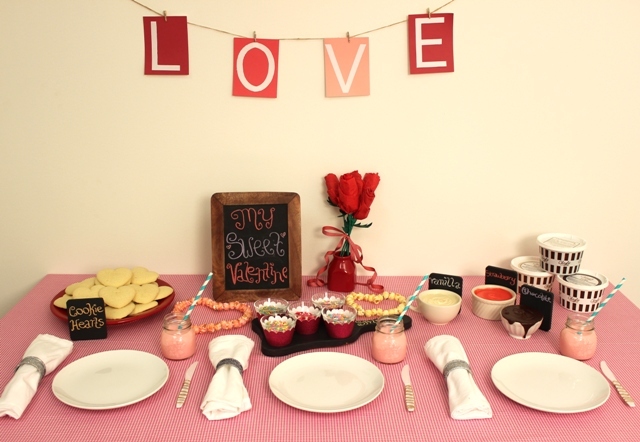 Throw a Valentine’s Day Cookie Decorating Party With the Cheryl’s Cookie Kit! The day of love is finally upon us, so give Cupid the sweet welcome he deserves and throw a Valentine’s Day cookie decorating party! Cheryl’s Valentine’s Day Cutout Cookie Kit comes complete with everything you need for your big V-Day bash; plus, everything is delivered to your door, so there’s no need to trudge to the supermarket for your ingredients. Each kit contains 24 prebaked heart-shaped cookies, two tubs of Cheryl’s world-famous frosting (in vanilla and fudge flavors), and one container with six assorted Valentine’s Day–themed sprinkles. All you have to do is set the table, gather some friends and family, and get down to business! Here are our tips for throwing a charming Valentine’s Day cookie decorating party with your handy kit. When it comes to decorating cookies, the messier it gets the better! 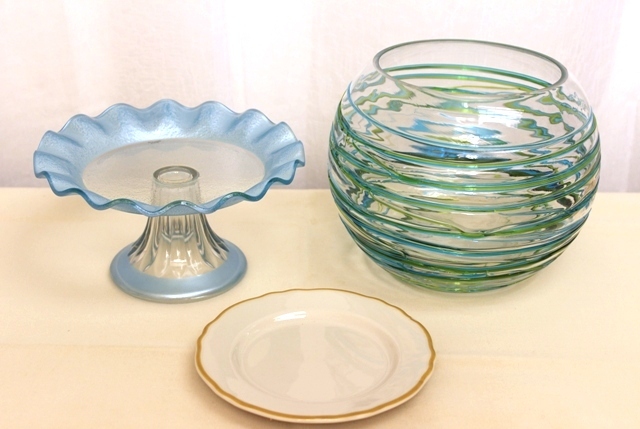 To keep cleanup time to a minimum, keep your place setting as simple as possible. Plain white plates make the color of your cookies pop, and a no-fuss glitter napkin ring adds some effortless bling. No need for any excess décor! Instead of giving each guest a fancy spreader for the icing, go with plastic knives instead: They get the job done, and you can chuck ’em in the garbage when the party’s over. To pretty them up, just wrap some inexpensive twine around the handles. For a quick festive touch, pour some strawberry milk into a mason jar. If you don’t like the taste of strawberry milk but still want to keep the pink theme going, just use regular milk and stir one drop of red food coloring into each glass. Finally, candy-striped straws nicely round out the overall laid-back and whimsical vibe of your sweet soiree. And now for the main event: the cookies! The best thing about Cheryl’s Valentine’s Day kit is that the oh-so-soft and delicious cutout cookies are already baked, so the hard work has already been done for you. Just remove them from the individual wrappers and arrange them on a large red plate. You’re ready to go! We used a rustic-chic DIY chalkboard coaster to label the cookies and complement the twine used in the place setting. A cookie decorating party wouldn’t be quite as fun—or delicious—without some downright scrumptious icing. 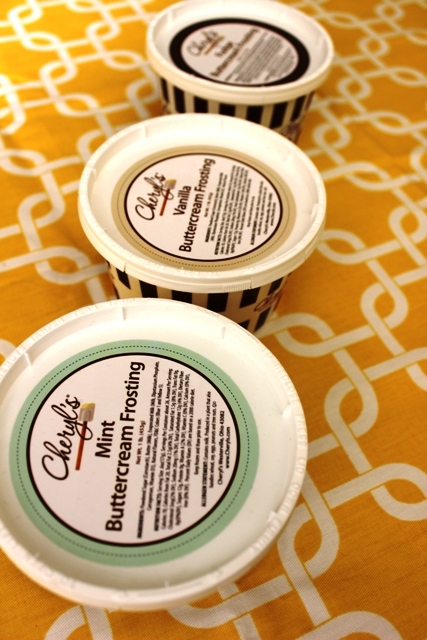 Your kit is already equipped with Cheryl’s smooth, rich and creamy vanilla and chocolate frosting. But for even more decorating options, you can order an extra tub of strawberry frosting (or any other flavors your taste buds desire). And since each kind of icing has its own personality, show them off in mixed-’n’-matched white bowls or cups. Then, label each bowl for your guests using a few more chalkboard coasters. It’ll give your table an adorably shabby yet put-together look. 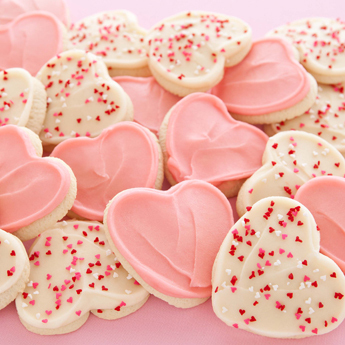 These festive little bits of sugar add a kiss of cuteness to your Valentine’s Day cookies. To dress up your sprinkles for the occasion, pour them into individual spice bowls and prop them up on sturdy glitter cupcake wrappers. Keep them organized by grouping them on a DIY chalkboard cheese board and labeling them. To finish the look, bring even more homespun elegance to your setup with these handmade tissue paper roses and popcorn hearts, or create them with your guests for some extra DIY fun! It’s the time you’ve all been waiting for. … Dig in! Grab your cookies and your trimmings and make your own sweet Valentine’s Day creations. There’s no limit to what you can do, so be adventurous! 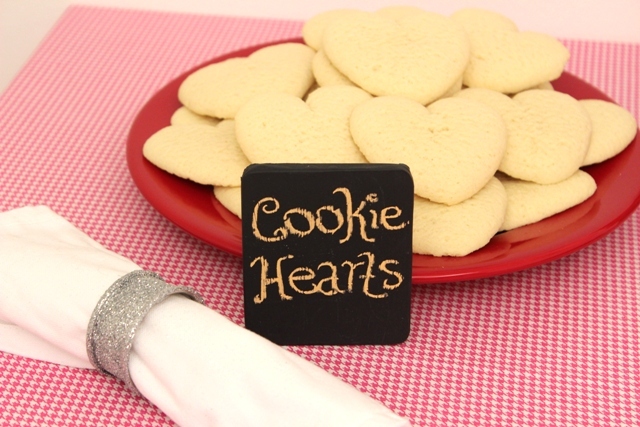 You and your guests will have a blast showing off your cookie-decorating skills and swapping your heart-shaped treats. Oh, and let’s not forget the best part of all: eating! The fun doesn’t have to stop with cookies. 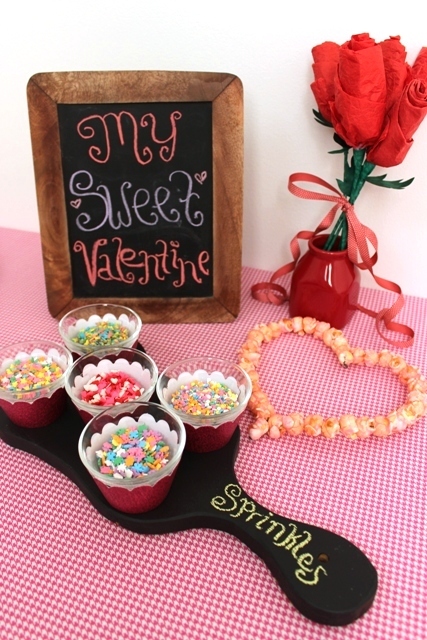 You can use your frosting and sprinkles to put some V-Day cheer on all sorts of goodies. 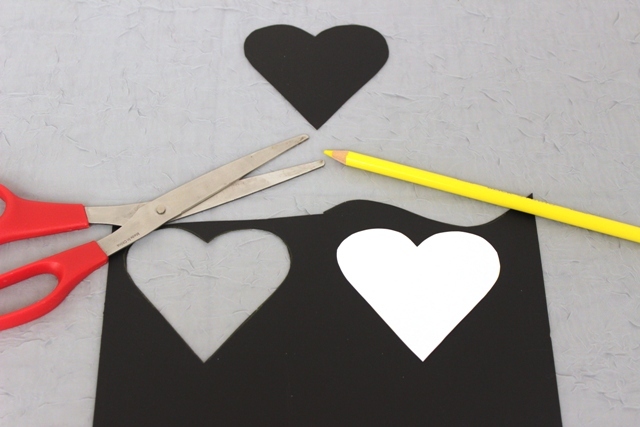 What other kinds of snacks will you be decorating with your Valentine’s Day cutout cookie kit? The Many Uses of Buttercream, Part 3: Deconstructed Cake! Hello again, frosting aficionados! Last week, we showed you how to turn buttercream frosting into a fantastic fondue dip. Now, we’re giving part three of our buttercream blog series a little modern twist. These days, deconstructed cakes are all the rage: They’re gracing the menus for everything from weddings, to swanky hotel restaurants, to at-home dinner parties. What is a deconstructed cake, you ask? Basically, it’s breaking down a cake to its essential elements—cake, frosting and toppings—and serving all of the separate parts together as a whole. 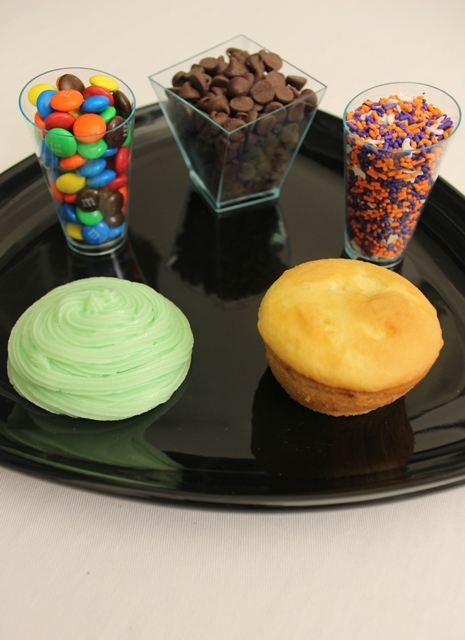 This allows your guests to enjoy endless flavor combinations … and have fun customizing their cake! Using store-bought cake mix, bake enough cupcakes or cakelets for each of your guests. You can also bake the cake in a jelly roll pan and cut the cake into tiny cubes. Don’t want to be married to one flavor? Don’t be shy! Bake as many flavors as you like. The more kinds of cake you make, the more creative your guests can get with their dessert. Once the cake has cooled off, place it on a large platter. Display various kinds of buttercream frosting on the platter any which way you prefer: Put the icing in separate tiny cups, or pipe the frosting directly onto the plate. Let your eccentric side run wild; when it comes to showing off your deconstructed cake, anything goes! 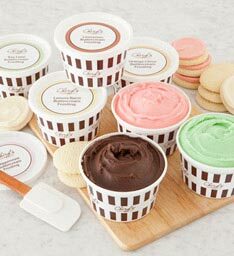 Cheryl’s has an infinite selection of buttercream flavors to choose from, like caramel, cinnamon, fudge, mint, peppermint and vanilla. Give your guests a little bit of everything so they can mix and match each cake with their beloved icing flavors. They’ll have more combo options than they’ll know what to do with! And finally, the cherry on the cake! 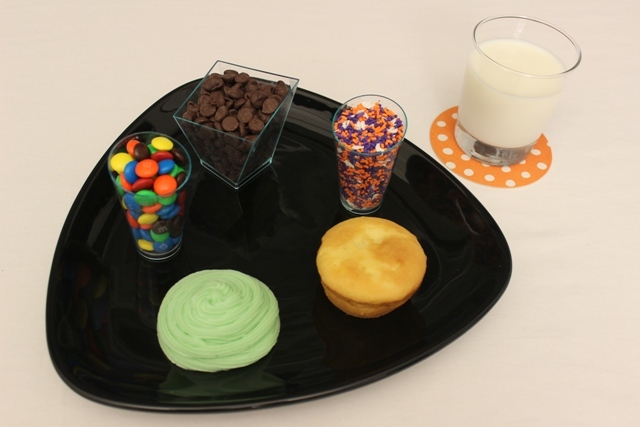 Pour any cake toppings of your choice into small shot glasses or miniature spice bowls, and arrange them on the platter next to the cake and frosting. When picking your toppings, you can go in any direction your imagination takes you: Take the classic route (sprinkles, candy, chocolate chips), go down the exotic path (coconut, fruit, chocolate shavings), or do both! It’s that simple: In three easy steps, you can turn dessert time into a festival of flavors. 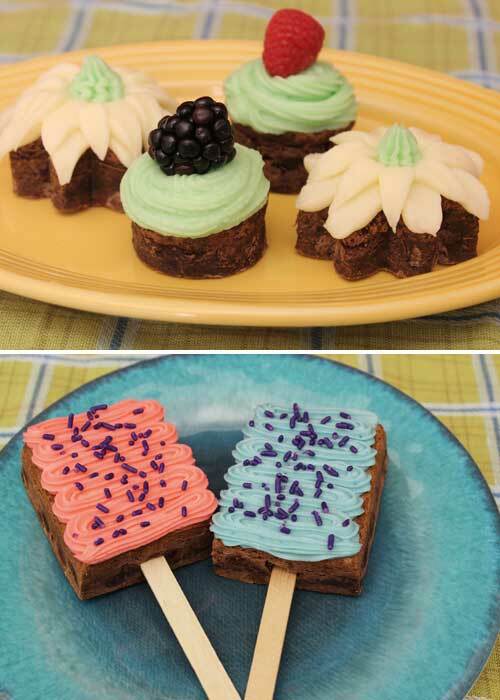 Keep an eye out for next week’s buttercream project: cake push pops! How would you put your own personal touch on your deconstructed cake? The Many Uses of Buttercream, Part 2: Icing Fondue! Welcome back to part two of our buttercream bonanza! Now that we’ve shown you how a bit of frosting can turn ordinary treats into works of art, it’s time to think outside the box of brownie mix and make some unique—and downright scrumptious—desserts with buttercream. Fill the outer compartments of the cupcake pan with different varieties of icing. 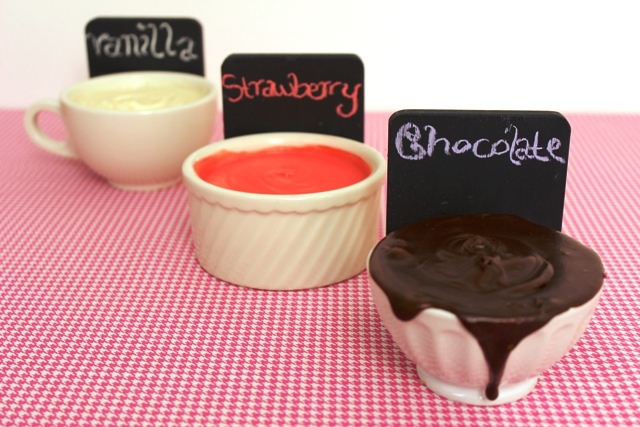 There’s a rainbow of buttercream flavors to choose from for your fondue. For our main event, we used Cheryl’s fudge, vanilla, mint and peppermint frosting. 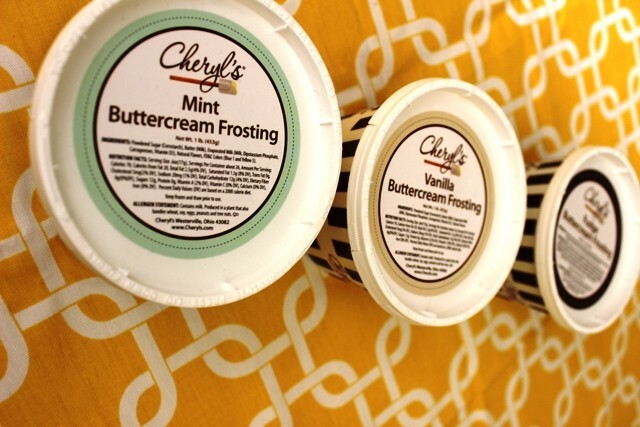 Other great Cheryl’s flavors to try: caramel and cinnamon. 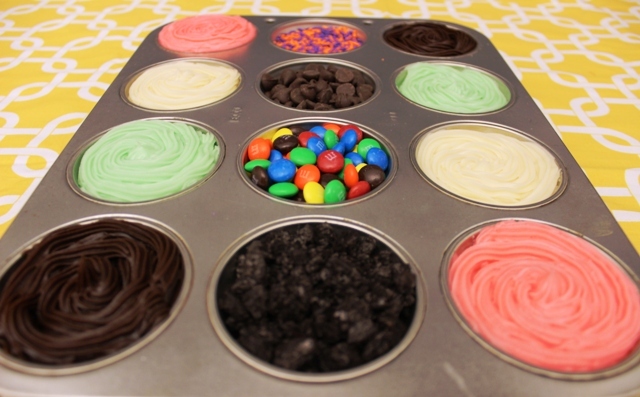 Add a little something extra by filling the inner sections of the cupcake pan with assorted toppings. Have fun with this! Your friends will have a ball mixing and matching the icing with the trimmings, so give them as many options as you can. We chose chocolate chips, sprinkles, M&M’S, and chocolate cookie crumbs. You can also try other exotic garnishes, like coconut or crushed walnut. On separate plates, stack up the sweet and savory treats you want to dip. You can dunk just about any yummy bite-sized foods into your icing fondue. We went with sugar cookies, strawberries, mini cupcakes, marshmallows and pretzels. You can spear ’em with fondue sticks or just dive in with your hands. And there you have it: an exciting dessert that will whip up tons of laughs at your next get-together. Come back next week for a very modern, very personalized buttercream dessert: deconstructed cake! What kinds of treats and toppings would you use for your icing fondue party? The Many Uses of Buttercream, Part 1: Traditional Treats! Just like the artist uses paint to create a work of art, the baker uses buttercream to make an edible masterpiece. If you have a colorful imagination, a quality pastry bag and a few tubs of sinfully delicious buttercream frosting, the possibilities for culinary creativity are endless! To help stoke your artistic fire, we’ll be taking the next seven weeks to show you all the different ways buttercream can be used. We have lots of fun projects for you to try out, so let’s get started! What’s the first image that pops into your head when you hear the word “icing”? Chances are you pictured either a towering layer cake or a platter of delectable bite-sized cupcakes, and for good reason. These fluffy desserts are a staple of every celebration, and there’s no limit to the fun you can have decorating them. 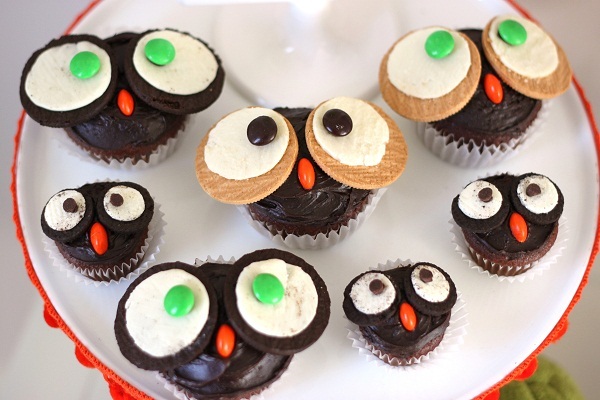 Check out Celebrations.com to find out how you can use buttercream to make the perfect birthday cake and create the adorable Mom & Baby Owl Cupcakes pictured above! Brownies don’t have to be so square! Sure, they taste great on their own, but topping them off with buttercream will enhance their flavor and give their appearance a lot of pizzazz. To get really creative with your chocolatey treats, cut them into shapes using a cookie cutter, or put ’em on a wooden ice pop stick for a fun snack on the go, like we did here. 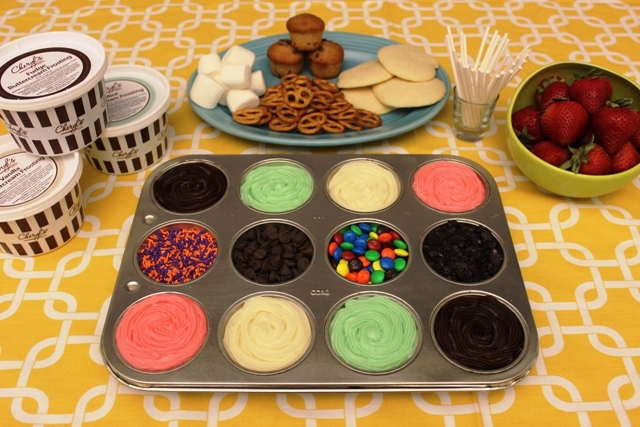 We created these fun and elegant dessert platters using Cheryl’s Premium Brownie Sampler and Buttercream Frosting Tub Sets (in vanilla, mint and strawberry flavors). 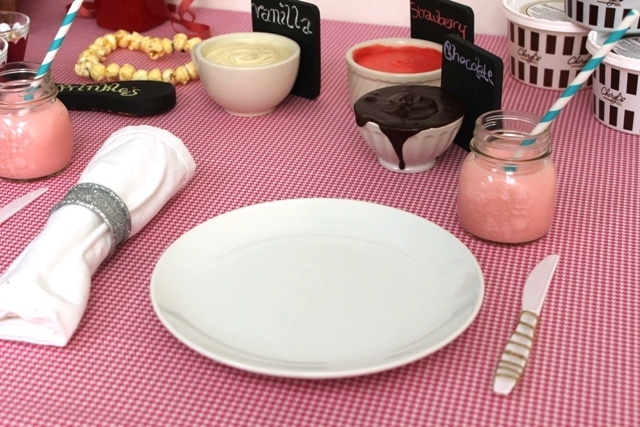 Next week, we’ll show you how to wow your party guests with buttercream fondue! Until then, tell us: What’s your favorite way to top cakes, cupcakes, cookies or brownies with buttercream frosting? Treat Your Kids to Cookies This Halloween! When all of those little witches and mummies come knocking at your door for the sweet stuff, treat them to Halloween cookies instead of candy. Your kids will have loads of fun helping you give out Cheryl’s wickedly delicious buttercream-frosted ghost cookies and pumpkin cookies. They’re individually wrapped, so it’s easy to drop them into any trick-or-treater’s candy bag or bucket. Get the Halloween Party Pack, and your house will become the trick-or-treating hot spot of the neighborhood! For those of you DIY-ers who want to dress up your hand-me-outs, find some inspiration with these easy and inexpensive Halloween treat bag ideas from Celebrations.com. Reward your helpers with their very own Halloween Treats Gift Bags. These bone-chilling pouches are filled with a buttercream-frosted cutout cookie, pretzel clusters, a mini brownie, a chocolate sandwich cookie and, of course, a ghoulish ghost cookie. Your kids will gobble them right up! Gear up your youngsters for their own trick-or-treating masquerade by creating your own Cheryl’s trick-or-treat totes. Just choose from three boo-tiful bag designs and fill them up with any combination of Cheryl’s cookies and brownies you please. Your kids will have everything they need to spread some fright on Halloween night! Share goose bumps and giggles by gathering the kids around the fireplace for some scary ghost stories and tasty Halloween treats. Throwing a Halloween cookie decorating party for the kiddos and their friends is easy; all you need are a few fun Halloween party planning ideas for children and the right supplies to set the eerie mood. With Cheryl’s Halloween Cutout Cookie Kit, you get all the essential ingredients for decorating your very own ghost cookies and pumpkin cookies. If your kids love Halloween cookies with a kick of spice, try making skeleton cookies with the Halloween Gingerbread Cookie Kit. Every kit comes ready with 24 unfrosted cookies, a 1-pound tub each of vanilla and chocolate buttercream frosting, and a container of Halloween sprinkles. You don’t even have to turn on your oven; just break open the box and watch the little ones bring their spooky creations to life. 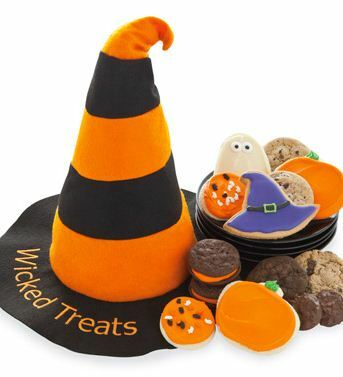 Celebrations.com has even more Halloween cookie decorating party ideas, so check them out and start frosting! You don’t have to go batty baking five different desserts the night before the school Halloween party. Instead, surprise everyone with scrumptious Halloween cookies that your kids’ classmates will devour faster than you can say “Frankenstein.” Cheryl’s Halloween Gift Tin Tower is brimming with fresh buttercream-frosted cookies, butter shortbread cookies, gourmet cookies, chocolate sandwich cookies, fudge brownies, and chocolate-covered pretzels. Plus, the gigantic stack of festive containers will bewitch students and teachers alike! For a smaller class, the Halloween Chocolate Chip Cookie will cast an equally powerful spell on hungry tummies. Before your frightfully tasty Halloween cookies take the classroom by storm, consider bringing these kid-friendly Halloween DVDs to the party along with your treats. There are dozens of ways you can help your kids and their teacher celebrate Halloween at school—take a look at these ideas from Celebrations.com! 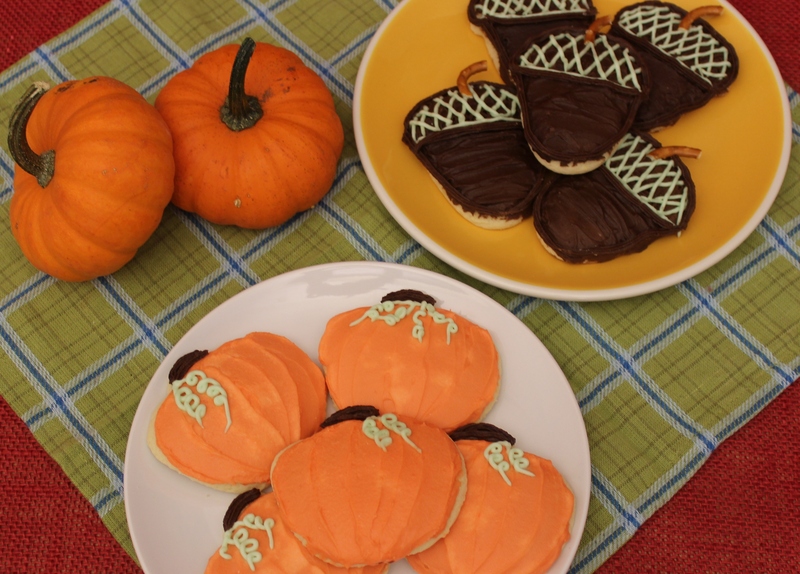 How do you and your kids plan on celebrating Halloween with cookies? Tell us your ideas! Only a little over a week to go until Mother’s Day is here! If you’re still scrambling for a great gift idea for Mom, check out our very helpful (and very color coordinated) gift suggestions for Mother’s Day! 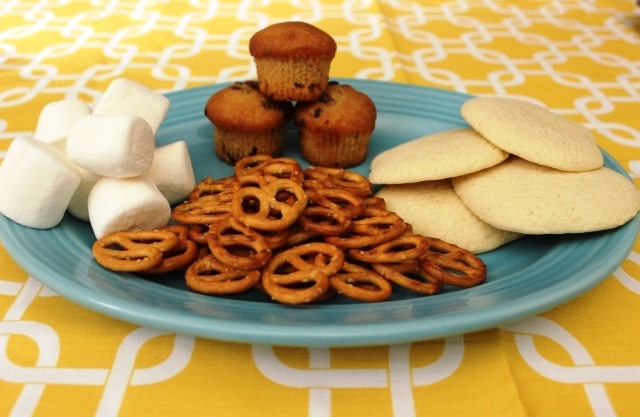 How to throw a fun, delicious and kid-approved Earth Day Party! Green and blue are definitely the go to colors for your Earth Day Party decorations. We’re betting you can find tons of great table cloths, pillows, linens and everything needed for an eco-friendly party. Just be sure to buy stuff you will use again or can donate when you’re done. When looking for plates, utensils and cups make sure to find all recycled/recyclable products or items that you can use again in the future! Mason jars have been a popular choice for parties in the last year with very good reason. The reuse of mason jars is an endless list of fun and easy DIY projects. You can use them as centerpieces with bouquets of flowers in them, keep drinks fresh in them and ready for use, preserves, reuse for indoor plants, literally anything! Our friends at Celebrations.com have a very simple “dipped mason jar” how to on their blog here. Looking for a fun and edible centerpiece idea? We’ve got you covered! Our new cookie flower pots are perfect for a family-friendly Earth Day party. Our delicious buttercream frosted cookies are delivered freshly made and decorated with spring and floral shapes and colors, contained in a reusable tin. All of our cookies are made with the finest and freshest of ingredients with no added preservatives! Kids will love the bright festive colors and sweet tastes. 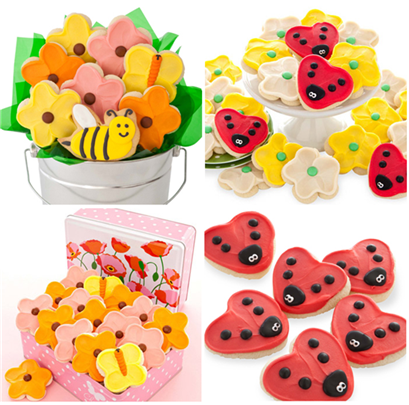 We also have plenty of flower, lady bug and butterfly cookies to place at the table as decorative Earth Day treats. Of course no Earth Day Party would be complete without some fun and educational activities! All activities are inexpensive (or free! ), fun and easy to do no matter the size of your party. Earth Day Word Puzzle: Create your own crossword or word scramble list (can find free programs online) using Earth Day related words! Recycle Relay: Divide into teams (2 or 3 teams depending on party size) and give each team a bin filled with recyclables like plastic bottles, milk jugs, cardboard, etc. and three empty bins labeled as “Plastic,” “Paper” and “Glass.” Tell the teams that the first team to correctly sort all of their items in the proper bins wins! Earth Day Pledge: Let them decorate plain white t-shirts with fabric markers or eco-friendly fabric paint with their Earth Day resolutions and ways that they can help the environment! At the end of the day, you can make a good bag using recycled paper lunch bags filled with an individual Cheryl’s cookie (! ), pencils, stickers, and (a great find from the Target dollar spot!) 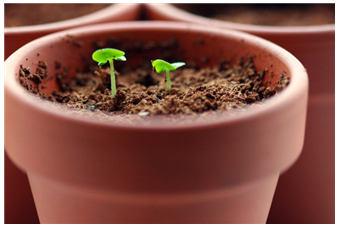 a small potted plant for them to take home. This is a great party to throw anytime during the nice weather months ahead, with a great message that’s important to learn about every day of the year. Valentine’s Day is almost here it’s time to set out making thoughtful and enjoyable Valentines. Luckily for us, we’re at one of the best gifting companies around, so we know where to look first! We’ve got some great cookies and crafts ideas to share with you. If you’re looking for a really simple and sweet gift, our Cheryl’s $5 Valentine’s Day Heart or Hug Bug Cookie Greeting card is a fast and fun way to say hello. An adorable Valentine’s Day themed cookie delivered in a single-sized box, for only $5 delivered; the same price as a regular greeting card, but sure to be far more appreciated. This would be great for a group of loved ones you want to send a greeting to. But if your class list is bulking up or you just want to get a tad bit more creative with it, we found this adorable idea from blogger Kerry at Kerry’s Paper Crafts, that we think you’ll love! 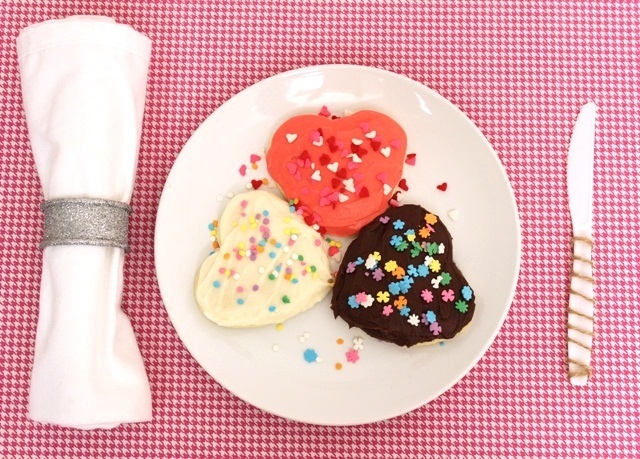 Get an order of Cheryl’s Buttercream Frosted Cut-Out Heart Valentine’s Day cookies (available in 12-24-36-72-100 count) and try not to eat them all! (Good, first step). Each cookie comes individually packaged, which is great for children’s Valentines to hand out in class. Kerry’s Paper Crafts blog shows how to dress up adorable little pillow boxes with small card greetings tied on with decorative ribbon. We loved the idea and looked through our sister company’s site (FineStationery.com) for children’s Valentine’s Day cards to attach. There are cards for both boys and girls that would make the perfect finishing touch to this sweet Valentine’s Day treat. X’s and O’s, dinosaurs, basketball, hearts, penguins, there are plenty of card choices to suit your individual tastes and make your Valentines stand out from the crowd! An even simpler idea that can be used for both children and adults, Fine Stationery also has Valentine’s Day stickers that can be easily placed on each cookie! You can personalize your message online before ordering, right down to the font style you want used and the different color patterns! They go the extra mile to make these personalized stickers special for you and only you. Once the stickers arrive, just apply them to your cookie greetings for a clean and festively decorated Valentine ready to go! Are you extra crafty? Head over to Kerry’s Paper Crafts to learn how to make your own decorative pillow-boxes and little paper greetings to attach, just make sure they’re large enough for a delicious cookie greeting inside!